Set: The collection of instruments, Rhythms, Q.T.s, and other presets, stored in a file for playing. Track: A part of music/style with which other parts accompany to compose the music. A track may contain notes, voice, or style modifications. Style: Rhythms including 1 to 19 parts, accompanying chord. Chord: The synchronized music played with rhythm, after pressing 3 to 7 clavier at once. Clavier: The black/white keys of the keyboard, to which notes are assigned. Note: The certain pitch/frequency of instrument sound. Main notes are Do, Re, Mi, Fa, Sol, La, Si or C, D, E, F, G, A, B, which are assigned to a group of 7 white claviers. Drum: Different percussion instrument sounds, unified and stored as a single instrument. Percussion: Recorded templates of drum compositions, assigned to the claviers and stored as a single instrument. Octave: The group of 7 white plus 5 black claviers, beginning with the note Do/C. Offline Activation Code: A four-piece digital code, provided after online activating of premium features. It can be used for offline activation the purchased features, after reinstalling the application. Notice that this code is unique for each device and must be used exactly as a multi-piece code. Slider volumes for setting the sound volume of pads, lower and upper tracks, drum, percussion, bass, and accumulators, depending on the state of slide mode button. Mode: Converting the keyboard to a double-row keyboard to encompass more claviers. Tab: Show/Hide the tab (Described on spot 22). Record/Play: Recording/Playing files or composed music. Q.T. : A custom setting of pitch in semitone or quarter tone. Page: Go to the next pages to see the other features. Sounds, settings, filters, and effects defined for specific (DNC) instruments. DNC setting can be changed by holding down the button. After-Touch: Splits the keyboard and brings after-touch sounds together with instrument sound. Pad (1 to 4): Plays a style (If exists) in a synchronized manner with the main Rhythm. The sound can be changed by holding down the button. Tempo: Setting tempo by rotary knob. Default setting are set by holding down the button. Octave: Offsetting track(s) octave using rotary knob. Default setting are set by holding down the button. Transpose: Setting system (Q.T.) as much as half tone using rotary knob. Default setting are set by holding down the button. Tempo Lock: Locks the tempo on current value. Chord Memory: Current chord is kept. Chord Mute: Mute/Unmute Chord sound (Synchronized to the main rhythm). Drum Mute: Mute/Unmute drum/percussion sound (Synchronized to the main rhythm). Open: Loads a set file, music, or main set. Load A Set: Quick loading of a set file. Save: Saving the set/music, saving as an MP3 file, or storing artist/music information. Save as Set: Quick saving of a set file. Data Manager: Downloading instruments, rhythms, skins, etc. Setting: Shows the setting page. Set: Setting current set, including instruments, rhythms, pitches, etc. Volume/FX: Setting volume or effects for keyboard, style, and microphone. Music Info: Music/Artist information, including title, album title, etc. Export to MP3: Exports the composed music as an MP3 file. Mic: Using microphone as an amplifier or as a tool to record voice while playing or after playing on a separate track. About: Shows information about the application. Reset/Tap Tempo: The style plays from the beginning if it is being played. When the style has stopped, tapping this button intermittently will cause the tempo to be set at the same rate as tapping. • Start: The style begins when a chord is assigned using claviers. • Start and Stop: The style stops when claviers are released (After assigning chord by claviers). • Off: Assigning chord will have no effect on style start. Fade in/out: Style fades in on the beginning and fades out on end. This section is used to combine two music files together using Player 1 and Player 2. The sliding control is used to set the sound volume. 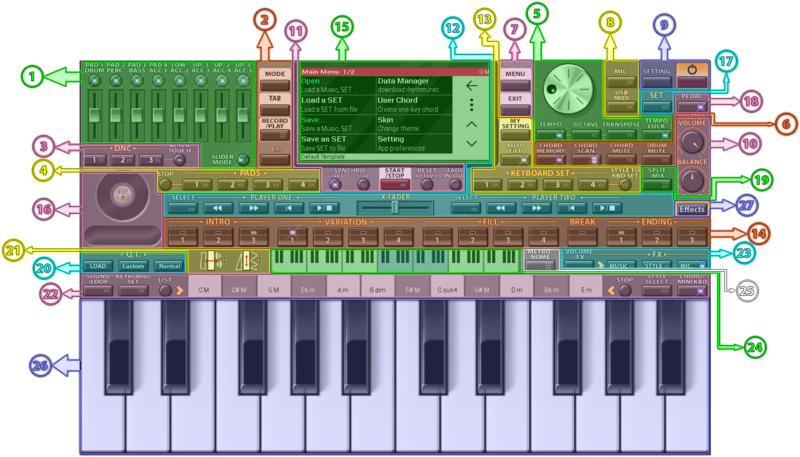 Keyboard set: Changes set (instrument, adjustments, etc.) using Keyboard Set 1 to 4 as hotkeys to speed up playing process. Keyboard sets can be set by holding the buttons. Style to Keyboard Set: When active, choosing variation number will also set “Keyboard Set” number (1 to 4). My Setting: Loads settings (behaves like keyboard set). Current setting will be saved on holding. Auto Fill: When active, Fill section is played on tapping any Variation. Intro: Choosing Intro number (1to 3). Variation: Choosing Variation number (1 to 4). Fill: Choosing Fill number (1 to 4). Ending: Choosing an Ending number (1 to 4). The sections can be edited by holding the corresponding button. Pitch Bend/Joystick: Instrument sound pitch shifts in halftones (adjustable) by dragging to left/right. Built-in sounds such as piano pedal might be played by dragging up/down for specific instruments. Ribbon: Instrument sound pitch shifts by dragging to left/right (adjustable). 17- Setting the current set: Instruments, rhythms, systems (Q.T. ), etc. 18- Pedal: Turn on/off the sustainability of sound after releasing claviers. Off: Only one instrument can be selected. 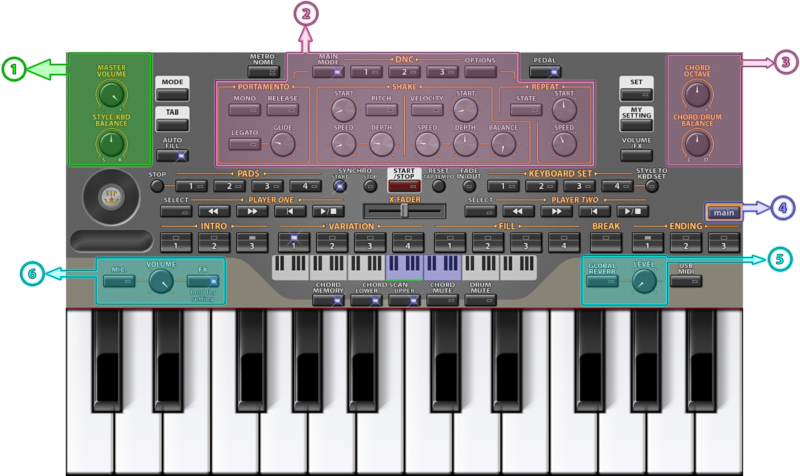 Split: Multiple instruments can be selected and used on split parts on the keyboard. Mix: Multiple instruments can be selected. The sound of instruments is combined together. Load: Loads a system (Q.T.) file. Custom: Manual system (Q.T.) setting. Normal: Default system (Q.T.) setting are restored. Pitch Shake: The pitch shakes according to the horizontal position of the finger on the Clavier. Balance Shake: The volume shakes according to the horizontal position of a finger on the Clavier. Volume Drag: Instrument sound volume shifts by dragging finger on claviers, vertically. Pitch Drag: Instrument sound volume shifts by dragging finger on claviers, vertically. Sound/Loop: Normal or looping sounds. Sound files can be assigned to keys by holding down the button. Keyboard set: Shortcuts for Keyboard Sets (1 to 4). Style Select: The quick setting of predefined styles. Chord/Mini KBD: An auxiliary compact keyboard for choosing a chord or playing an instrument. List: Shows the list of current settings. Stop: Stops current playing item. Volume/FX: Setting sound volume, balance, and setting sound FX for instrument, style, or microphone. The style volume window appears by holding down the button. Music: Turns on/off sound FX for instruments. Style: Turns on/off sound FX for the style. Mic. : Turns on/off sound FX for the microphone. Master Volume: Sets master volume. Style/KBD Balance: Sets the percentage of style versus instrument sounds. Main Mode: The default DNC which can be modified. Option: Shows setting page of DNC. Mono: Only a single note can be heard at a time when this option is turned on. Release: Connection of sounds will be lost after releasing claviers when this option is turned on. Legato: Sets the level of legato by GLIDE knob. Chord Octave: Sets chord in the style. Chord Drum Balance: Sets the volume of chord versus drum. 4- Returns to the main screen. Activates/Deactivates reverb effect by setting the level of reverb. Mic: Activates/Deactivates microphone and sets the microphone volume by volume knob. FX: Activates/Deactivates FX and sets the knob volume by volume knob. Auto Save: Turns on auto-saving option for Set. Stop on Changes: Stops music when modifying main data (Please turn it on, if made problems.). Rotate by Sensor: Rotates the screen when you rotate the device. Auto Portrait: Rotates the screen automatically on some windows for a better experience. Memory Control: The data will not be loaded if enough RAM is not available. Back button: Shows/Hides Back button. Menu button: Shows/Hides Menu button. Separate Paths: Keeps paths and positions for each item in file dialogs separately. Time: Sets the duration of vibration. Contrast: Sets contrast (Effective only for some skins). Message Time: Sets how long message awaits on screen. Colorful Lists: Different color for each list. Show List Tabs: Shows/Hides tabs below the lists (P1, P2, …). Show Drum-Kits: Adds Drum-kits to the list of instruments. Count of Keys: Sets the number of claviers on the keyboard. Start Key: Sets the beginning note on clavier. Show: Clavier is pressed when tapping it. Clavier Caption: The type of the label of claviers according to the notes. Clavier Quality: The graphical quality of claviers (Less quality might increase performance). Touch Response: The sound volume change according to the vertical position of a finger on clavier. The lower the position, the more volume. Black Area: When active, white claviers are inactive over the area covered by the height of black claviers. Black Keys Size: Sets the height of black claviers. Pitch Shake Range: Sets the range of pitch change according to the horizontal position of the finger on clavier; if Pitch Shake option is activated. Pitch Drag Range: Sets the range of pitch change according to the vertical position of the finger on clavier; if Pitch Drag option is activated. • Don’t Change: Skin doesn’t change. • Auto Change: Skin changes. • Full Screen: Skin changes and virtual keyboard hides. Touch Sensitivity: Setting touch sensitivity on claviers in MIDI device. After-touch Simulation: Setting sensitivity value for After-Touch capability. Direction: Sets which keyboard dominate. • From MIDI to App. : MIDI device keyboard overrides application. • From App. To MIDI: Virtual keyboard overrides MIDI device. 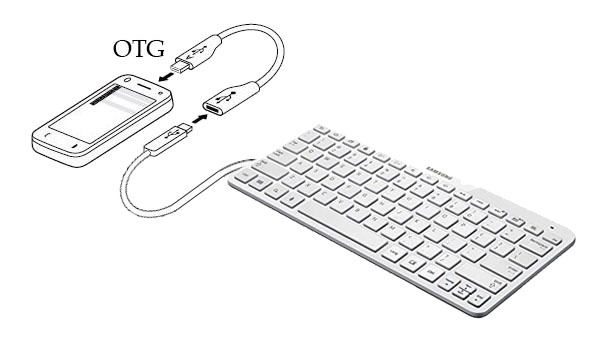 • Both: MIDI device and application keyboard are active. Live Octave: When active, claviers octave change on the virtual keyboard, while claviers are pressed on MIDI device. This capability is available only if claviers count keeps the initial value after connecting the MIDI device. Start/Stop Delay: Setting delay to begin fading. Range: Setting the range of pitch change on the joystick. Lock: Locks the value, set by the joystick. Range: Setting the range of pitch change on the ribbon. Speed: Sets the general speed of metronome. Measure X: Sets the number of short metronomes, played between long metronome. Measure Y: Sets the number of long metronomes. Loop Tempo: Looping sound speed can be set using Tempo controls. Multi-Loop: Multiple looping sounds can be played. Scale Loop on Convert: Sound files are scaled to be synchronized with the other parts of the style, after converting. Style Section Change Method: Sets the behavior of changing playing different parts of the style. • Don’t Wait: Changes immediately. • Wait for A Cycle: Waits for a cycle to change in a synchronized manner. • Wait for A Section: Waits for a section/part to change in a synchronized manner. Style Section Repeat: Keeps playing the section after double tapping on a section. • Customized Major One-Key: By tapping one clavier to set the chord to the customized major chord. • Customized Minor One-Key: By tapping one clavier to set the chord to the customized minor chord. • Major One-Key: By tapping one clavier to set to the major chord. • Minor One-Key: By tapping one clavier to set to the minor chord. • Diminished One-Key: By tapping one clavier to set to the diminished chord. • User Defined One-Key: By tapping one clavier to set to the user-defined chord. • 2 Keys: Rhythm starts on tapping 2 chord key. • 3 Keys: Rhythm starts on tapping 3 chord key. • Minimum: Sets the chord sound quality on minimum. • Half: Sets to the half chord sound quality. • Full: Sets to the full chord sound quality (Compatible with powerful devices). Set Style Instrument: When active, style instruments can be modified by Set button. · Main Microphone: Sets the main microphone as input. · Secondary Microphone: Sets the second microphone as input. Low Latency: Low Latency capability is activated (Disable this option if there are problems in microphone sound). Quality: Setting the compression quality: Best (Slow), Good, Normal (Fast). Channels: Setting channels (Mono, Stereo). Sampling Rate: Setting sampling frequency. Global Reverb FX: Sets global reverb effect value. Output Wave Type: Sets the quality of wave output in terms of frequency, bitrate, and channels. Touch Performance: Touching response speed. Real: Reduces the latency of the main sound. Play an Additional Sound: Plays an additional sound to check the latency. Play Recorded Note: Plays the recorded sound of the current instrument, before the main sound. Set, Template: Collection of instruments, rhythms, systems (Q.T. ), plus other settings, predefined in a file to be used for playing. Music: Similar to Set files, accompanying recorded notes. Rhythm, Style: A Rhythm in one or more sections, together with chord, settings, filters, and effects. Instrument: An instrument with one or more sound, together with settings, filters, and effects. System: System adjusting interface for local and oriental music. Track: Recorded notes for an instrument, in a separate track. Section: A separate part of a style. Model: Settings and instructions of a physical Org device, stored as a text file to be used when connecting the Org device to the application, using USB MIDI. Chord: Defined chord to be used for setting chord by claviers. Skin: Skin file which should be used with a “JPG” file, with the identical title. Skinz: A compressed collection of skins and “JPG” files, stored in a single file.